Our powerful VOLTRIC TRI-VOLTAGE SYSTEM equipped with new linked grommets offers more power than ever before. Compared to the previous model, the VOLTRIC 70 E-tune cuts down on power loss to give players a 3% increase in power. Furthermore, with the introduction of the new E-tune parts, the TRI-VOLTAGE SYSTEM has been taken to the next level. Traditionally, extra weight at the top of the racket frame has increased power while reducing maneuverability or control from the player. 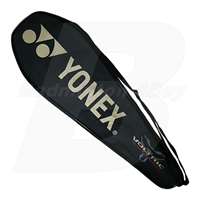 In contrast, less weight on the top of the racket frame increases speed but reduce power. Yonex solves this problem by using the new TRI-VOLTAGE SYSTEM to successfully combines the contrasting characteristics of exceptional power and control. Within the TRI-VOLTAGE SYSTEM, Tungsten inserts are positioned at the 2 and 10 o'clock positions of the frame, and at the T-Joint area. Tungsten provides more than 10 times the relative density of graphite, allowing the sides of the frame to be thinner and more aerodynamic and therefore achieving the combination of heavy smashes and swing speed or fast racket handling. In VOLTRIC, the weight is balanced on the top of the frame and at the joint area which allows good handling while also maintaining power. The thin sides of the frame and at the top of the head reduced air resistance and improve the handling even further. Players can now make a full swing even during short range rallies as VOLTRIC responds instantly to even subtle movements. Another innovative Yonex technology, SOUND FILTER uses new materials at the two and ten o'clock positions to reduce only high pitched and dull soundwaves. This produces a louder and sharper sounds on impact to unsettle opponents, and provides a more aggressive tone to your game for a relentlessly attacking style of play.